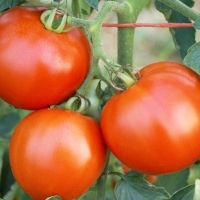 The tomatoes you see sold in the supermarkets are usually shipped long distances from the growing area to the supermarket. This is why they are firm and not completely ripe. Fully ripened tomatoes bruise easily, even under controlled conditions. They will become a bright red color, soften slightly, and develop good flavor and aroma if kept for a few days at room temperature (between 55 and 70 degrees F). The cold temperatures stops the ripening process and kills flavor. If you keep tomatoes in the refrigerator, it gives them a mealy unpleasant texture. Tomatoes should be kept on the kitchen counter. 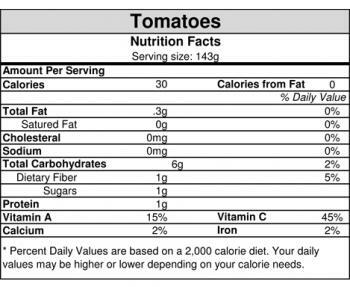 Once the tomato is fully ripe, it can be refrigerated only for a few days, any longer results in flavor deterioration. In a bowl, whisk together balsamic vinegar, lemon juice and olive oil. Taste for seasoning. Set aside. Place the tomatoes on a flat surface. Cut the smaller ones in half and the larger ones into slices. Arrange all of them in a single layer, flesh side up. Season them with salt, black pepper and sugar. 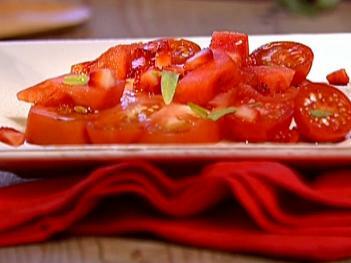 Drizzle the tomatoes with the dressing. Toss them with the tarragon and strawberries. Arrange the tomatoes down the length of 6 rectangular plates. Drizzle them with the remaining dressing and top with the watermelon. Serve immediately.